A dog that devoted his life to public service has been shunned in his time of need, and many say it is a disgrace. 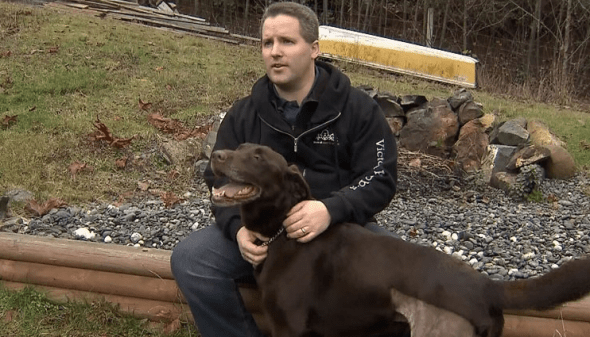 Doc, a chocolate lab that has worked as a gun and drug sniffer for Corrections Canada for most of his life was injured on the job and needed knee surgery to repair damaged ligaments. When Corrections Canada refused to foot the bill for his treatment, Doc was taken in by a rescue group who took it upon themselves to look after him. Victoria Adoptables Dog Rescue, a Victoria-based non profit that rescues abandoned dogs came to Doc’s rescue, even though he was not technically abandoned and his “owner” was very much able to pay the bill. Traditionally, all working and service dogs care is paid for while they are working and even when they are about to retire, but for some reason Corrections Canada made the decision not to support Doc’s care. Victoria Adoptables did their own fundraising to cover the surgery for Doc, but Devin Meads, who is the 6 year old lab’s foster parent thinks the CSC’s actions are terrible. “I don’t think that’s fair that you hurt yourself and that’s it, game over?” said Meads. The CSC has since agreed to step up and pay the entire bill, but it is a mystery why they refused in the first place. “CSC is examining this incident to learn how the dog’s case was handled, and to ensure that the appropriate process will be followed for any future incidents of dog injury,” spokesman Jean Paul Lorieau wrote. Doc, unaware of all the controversy about his care, is happily recovering in his foster home and will be ready to be adopted in a few weeks. Anyone interested in information about adopting him can contact Victoria Adoptables. This is disgraceful and an indication of a much more insidious problem. Corrections Canada’s refusal to give medical aid to a member of their team is a clear indication to me that they see Doc as a piece of equipment, a tool, and not a fellow team member that has pain and suffering and needs treatment just as any of their human employees would if hurt on the job. I would be worried about the other canines in their care as well. I think Victoria Adoptables Dog Rescue should contact every media outlet and continue to tell this story to public humiliate this organization. What a disgrace!!!!! Canada Law Enforcement is now known for having compassion for their animals. Remember the GSD that was beaten and paralyzed and thrown in a dumpster to die…Thank the RCMP for that!!! They sold the dog for like $50 after it washed out of the K9 program. Oh Canada…..Shame on You!!! That’s totally disgusting to just throw away and abandon part of your team. A living, breathing, being with feelings. Bravo to Victoria Adoptables for stepping in!! Let me tell you, and I realize the public service is Canada’s whipping boy, but if you are a “troops” level employee I can tell you they don’t treat their human employees any better than their K9 employees. Wishing Doc a speedy recovery. Let’s hope he finds his loving forever home. As for Corrections Canada, they should not be allowed to have dogs if they will not care for them properly. Even though I wouldn’t agree with it, I could understand their argument more if the dog was hurt outside of his line of duty. He was hurt in the line of duty. Pay the damn bill! It is terrible that Canada would not fix working dog Doc’s knee. There is a custom posh dog knee brace that supports the injured knee and the knee does heal. My own dog had torn knee ligaments and we got a custom posh dog knee brace, and never needed the painful knee surgery. Now my dog is walking normally with out using the brace anymore.